The Jazz Band earned a standing ovation and the Brass Ensemble played beautifully on an impressive range of pieces, but the most notable performance from Wednesday night’s concert at Salter Hall came from the smallest and newest group. The College’s new Woodwind Ensemble—Tom Pizarek ’09 on bassoon, Jason Allen ’10 on flute, and Matthew Meyer ’12 and Stephen Maynard ’11 on clarinets—opened the concert with an impressive debut, playing Johann Sebastian Bach’s "Suite No. 1 in D Major." "When I arrived on campus this fall, I was told that the Music Department had realized that there was a lot of top-notch talent in the area of woodwinds, and that they were trying to start up a woodwind ensemble," Assistant Professor of Music Vanessa Rogers, the ensemble’s director, said of the group’s genesis. "I was really pleased to find that the woodwind players who expressed interest in being in this ensemble had so much talent—this is why we started off the year with a Bach piece, which can be very difficult to pull off!" "The members of the Woodwind Ensemble are also very involved (as most Wabash men are) in a million other things on campus, so we have only had a few short rehearsals," Rogers added. "To make up the Ensemble, we have a variety of instrumentalists assembled together—unfortunately, I have yet to find a composition that is written for that exact configuration of instruments! So we are arranging a lot of other good music to fit this configuration and the talent of our members. This year we will hope to be performing everything from Renaissance music to Mozart to the Beatles—so our audiences will hear a little bit of everything. "There is a lot of musical talent on the Wabash campus, and I'm really hoping that more great woodwind players will come out of the woodwork and join our group once they hear us play," Professor Rogers said. "We are especially looking for an oboe player!" Click here for a photo album from Wednesday’s concert featuring the Brass Ensemble, Woodwind Ensemble, and Jazz Band. 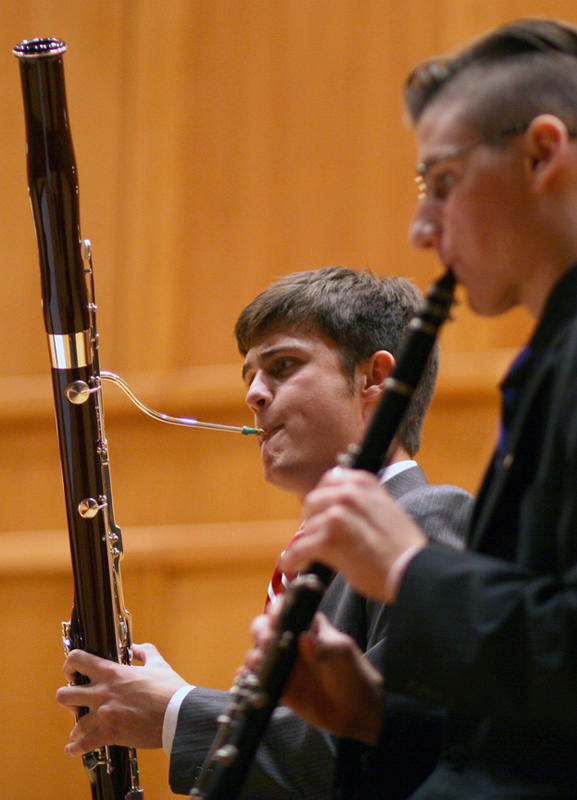 In photo: Tom Pizarek ’09 plays bassoon alongside clarinetist Matthew Meyer ’10.